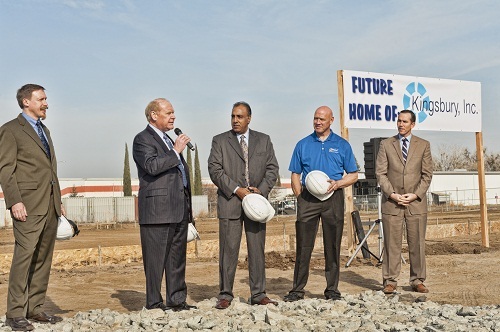 On January 8, 2014, Kingsbury, Inc. broke ground to officially begin construction of a new 33,000-square-foot bearing repair and service facility in Yuba City, California. The project by Yuba City contractor Hilbers Inc. should be complete in September. Kingsbury celebrated its centennial in 2012. In 2006, it opened a repair and service shop in Yuba City to serve its Western US and Canadian customers. The location was chosen because of the proximity to numerous hydroelectric, steam and gas power plants in the Western states. After six successful years in a leased building, Kingsbury has made a commitment to the area with a new company-owned facility, purpose-built specifically for expert repair and field service of all types of fluid-film babbitted bearings. The multimillion-dollar facility will house cutting-edge equipment, incorporate infrastructure to support a 30-ton crane and will be climate-controlled to facilitate the extremely tight-tolerance machining required for the company's products. The facility will provide support for all clients west of the Mississippi River, including all dams and pumping stations operated by the California Department of Water Resources. Michael Brawley, Kingsbury Vice President, conducting a tour of the existing Repair & Service Facility next to the construction site. During the groundbreaking, held at 1:00 pm Jan. 8, at 209 Burns Drive, guests were invited to the existing facility next door for refreshments, and for tours and a showcase of equipment and current plant activities. Services include diagnostic and repair capabilities, babbitting foundry work, precision machining, as well as expert upgrades and retrofits for all types of fluid-film bearings and associated equipment. Lean more at www.kingsbury.com.